Speculation and numbers are swirling around college hockey world right now. Some teams are definitely in the NCAA Tourney based on PWR numbers and probabilities and some are definitely out. Others still are in limbo with games to be played, and UMD fits that category. With a guaranteed two games this weekend in the NCHC Frozen Faceoff, the Bulldogs are right on the bubble according to the PWR hanging in at #13. With 16 teams getting in the Tourney, there are the auto-bids that keep moving the cut line up the rankings. #13 is pretty safe place to be, but two losses this weekend will definitely make a slide in that ranking for UMD. The good news? With the sweep of Miami last weekend, UMD is guaranteed an over 0.500 record, the first criteria for making the NCAAs. But what will it take to make the NCAAs? Northeastern Lose at least 1 game. 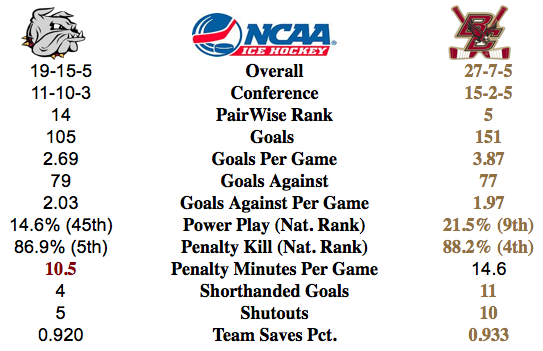 Jim Dahl's College Hockey Ranked is a great place to go to see the breakdown of the probabilities and possibilities. Can't lie, last weekend was a total surprise. Even with the strong defensive effort displayed the previous weekend at North Dakota, a split, let alone a sweep, at Saint Cloud was wishful thinking. Could this be it? The team's fans have been waiting most of the season to see the potential that preseason pollsters saw to pick UMD to win the NCHC. The type of season when a successful team brings back eight seniors. But it has been elusive until last weekend. UMD has the opportunity for their second home ice in the first round of the NCHC Playoffs as they look for their first trip to Minneapolis for the Frozen Faceoff. At this point, needless to say that it is Minneapolis or bust for UMD to continue their season. Picks by @afiskness. The Bulldogs wacky season continues. Last weekend the Bulldogs swept the Huskies in St. Cloud making them the favorite to get the final home ice spot in the NCHC playoffs. The two wins by the Bulldogs also moved them back up into the top 15 in the pair wise rankings. As long as the Bulldogs continue to win more then they lose in their remaining games they may be able to move high enough in the Pair Wise and have a .500 record needed to get them large bid for the NCAAs. PWR #18 Miami @ #15 Minnesota Duluth: This series has split written all over it. PWR #39 Western Michigan @ #2 North Dakota: The Fighting Hawks will secure the Julie and Spencer Penrose Memorial Cup with a home sweep this of the Broncos. 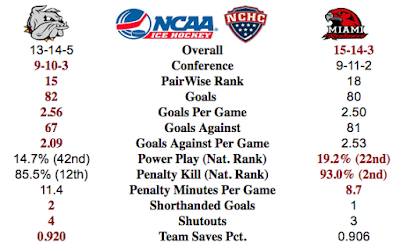 PWR #13 Nebraska Omaha @ #7 Denver: The Pioneers will sweep the struggling Mavericks in Denver. PWR #3 St. Cloud State @ #53 Colorado College: The Huskies let down will continue as they will split with the Tigers in Colorado Springs.